This guide details the interior vapor retarder requirements as per building code when insulating sheathing is installed on the outside of an exterior wall. The interior vapor retrader can be removed in certain cases and the underlying physics is explained in each case. Q. If insulating boards are installed on the outside of an exterior wall can the vapor retarder on the inside be removed? A. Yes, in certain cases. In climate zones 1, 2, 3, 4A, and 4B a vapor retarder is not required regardless of the use of exterior insulation (Section N1102.5 Moisture control – Exception 2). In all other climate zones, the addition of insulation boards on the exterior of the assembly helps reduce the potential for wintertime condensation occurring in the wall assembly. If enough insulation is added to the outside, then a vapor retarder on the inside is not necessary. Also, it is good practice to allow a wall assembly to be able to dry to at least one side, and since many insulation boards can be classified as vapor retarders, removing the vapor retarder from the inside allows increased drying of the assembly to the inside and improves the performance of the wall. The code recognizes this and addresses it in Section N1102.5 Moisture Control under Exception 3, which allows for the vapor retarder to be removed “where other means to control condensation are provided.” However this still requires some calculations to demonstrate that the potential for condensation is managed in the proposed design. The current 2007 Supplement to the International Residential Code (IRC) has made some changes to the definition and use of vapor retarders. These changes provide some clarity on vapor retarders, and can be used as guidance. So what actually is a “vapor retarder”? The current 2006 IRC describes a vapor retarder as a material that has a permeance rating of 1.0 perms or less (Section R202 Vapor retarder). This seems simple enough, but there is in reality a large variation in performance between a product with a 1.0 perm rating and a product with a 0.1 perm rating. 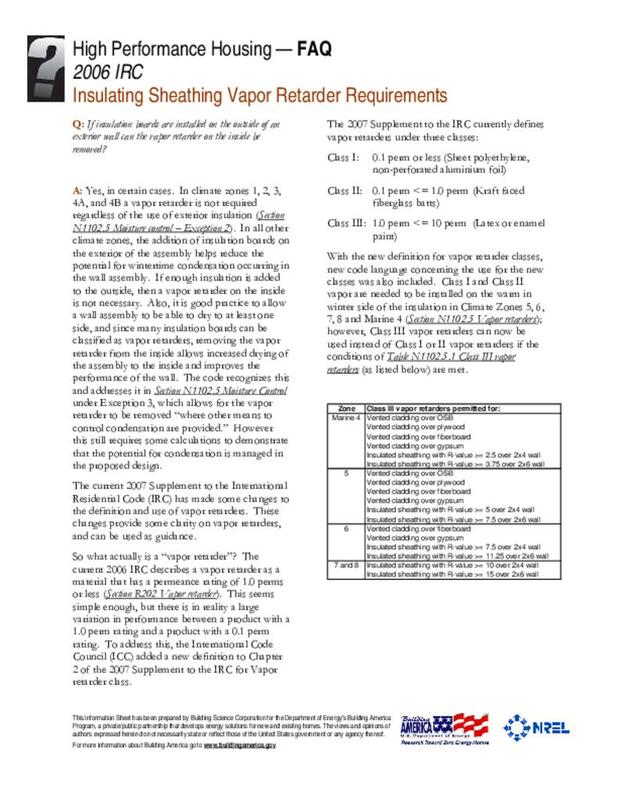 To address this, the International Code Council (ICC) added a new definition to Chapter 2 of the 2007 Supplement to the IRC for Vapor retarder class. With the new definition for vapor retarder classes, new code language concerning the use for the new classes was also included. Class I and Class II vapor are needed to be installed on the warm in winter side of the insulation in Climate Zones 5, 6, 7, 8 and Marine 4 (Section N1102.5 Vapor retarders); however, Class III vapor retarders can now be used instead of Class I or II vapor retarders if the conditions of Table N1102.5.1 Class III vapor retarders (as listed below) are met.